The home fixture against Port Vale has been changed and will now take place at 12:00 on Sunday 19 October. This will mean two games in three days for City who must travel to Rochdale the following Tuesday. Chester have given two year deals to Accrington Stanley midfielders Jay Harris and David Mannix. Both are Liverpudlians, Harris, 21, started his career at Everton and 22-year-old Mannix began at the Liverpool Academy. Supporters have just four more days now to take advantage of the second level season ticket offer equivalent to five free games. Following a meeting between the club and officials from the Football League it’s being reported that the transfer embargo placed by the PFA is not recognised by the League and City are able to deal in the transfer market as they rebuild their squad for the forthcoming season. City owner Steve Vaughan told the Liverpool Daily Post: “We had a very frank and open discussion, and the League’s officials were receptive of our stance. “It has been extremely well documented that we have a dispute with two of our players, Tony Dinning and Paul Butler, our stance is that they have acted outside the remit of their contracts, and the situation is in the hands of our legal people. A transfer embargo has been placed on Chester following action from the Professional Footballers Association (PFA). The club have made their first signing of the summer as 22-year-old midfielder Anthony Barry joins from Yeovil Town. The Liverpool born player began his career as a trainee at Everton before moving to Coventry City three years ago. He moved from there to Accrington Stanley in 2005 where he made 26+0 appearances (no goals) before his final move in January 2006 took him to Huish Park where he scored one goal in 52+22 outings. Barry has been given a two year deal by City. 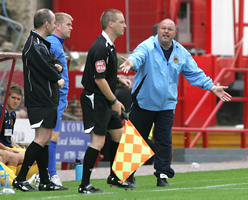 Chester will kick-off the 2008/09 season with an away trip on 9 August to Dagenham & Redbridge, this is followed, after the Carling Cup tie with Leeds, by a home fixture the following Saturday against Wycombe Wanderers. The club have announced that the Carling Cup tie with Leeds United will be televised live by SKY TV. The game is scheduled to take place at Deva Stadium on Tuesday 12 August. Chester have been given a home draw against League One side Leeds United in the first round of the Carling Cup. The game is scheduled to take place in the week commencing 11 August. The will be the first visit of Leeds to Deva Stadium. The sides last met at the same stage of the competition two season ago with the Yorkshire side winning 1-0 at Elland Road thanks to an Eirik Bakke goal. The club have accepted an offer from Stockport County for 29-year-old midfielder Kevin Ellison. Ellison nearly made the move to the Edgeley Park side last January but he now looks set to join the newly promoted outfit. Ellison now needs to agree personal terms before moving. He has played for County previously between 2001-04. Ellison, who has had two spells with City, was the top scorer last season with 11 goals. In total he has made 69+0 appearances for the Blues, scoring on 22 occasions. The Blues have announced that they’ve offered two year deals to Bradford City’s Eddie Johnson and Yeovil’s Anthony Barry. Forward Johnson is Chester born and has scored 8 goals in 54+17 appearances for the Bantams. He started his career as a trainee at Manchester United and had loan spells at Coventry City and Crewe Alexandra before joining Bradford City two years ago. Liverpudlian Barry joined Yeovil Town from Accrington Stanley in January 2006 and has scored once in 55+22 appearances for the Huish Park outfit since. Meanwhile talks are continuing with the agent of Vauxhall Motors striker Paul Taylor. The club have still not received police authority to stage their pre-season match against Liverpool on 12 July. The date picked, the only one their opponents could make, clashes with Chester races and the local police say that both events taking place at the same time would leave their resources stretched. Take a look back at the ups and downs of last season through the photographs of the Evening Leader’s Rick Matthews. Chester are set to open their pre-season campaign with a home game against Liverpool on Saturday 12 July, kick-off 15:00hrs. The game is subject to Police approval. Manager Simon Davies is keeping up his search for a striker to partner John Murphy next season. The club have been linked with Paul Taylor from Vauxhall Motors and Forest Green’s Stuart Fleetwood over the last week and talks with players and agents are still taking place. “I’ve spoken to Stuart Fleetwood’s agent, but he’s getting a lot of interest from leagues above ours so it looks unlikely at the moment, unless they weren’t to sort things out. We’ve registered a lot of interest, because he’s a good player, but it’s out of our hands when it comes to bigger clubs coming in.” said the Blues manager. The draw for the first round of the Carling Cup will take place on 10:00hrs on Friday 13 June. The first round matches are to be played in the week commencing 11 August. The club ticket office will be open today between 10:00-16:00hrs for supporters who wish to take advantage of the Early Bird season ticket offer. This is the last day of the offer which is equivalent to five free games and free car park pass. This can realise a saving of up to £125.00 (Car park pass not available for under 16s). *Concessions are pensioners at state pension age and full time Students (on production of a valid NUS card).